From Across the region the stories seem so true but are they really…. The Gettysburg National Park closes around 10 am or so. Ron Shawley working on a story for the national park was just about to leave the park for the night at about 9: 45 pm. Ron had stopped at the High Water Mark when he noticed Blue Fog” a common occurrence that many visitors see. Ron had his canon handy and decided to shot this oddity. Ron walked out to the edge of the High Water Mark, knowing all to well what played out here during the civil war. See notes below… For the record Ron used the following settings to shoot the Blue Fog. ISo 800 exp 30 sec aperture wide open – Ron during the process of taking about 20 pictures felt a cool air mass hitting him. This was no big deal the evening air was simply cooling down, and the air currents were just moving around. After getting back to his hotel he decided to view the pictures. The 1st picture, the 2nd picture, the 3rd and so on, until he hit the 12th picture he noticed something odd, what looked like a double exposure. How could this be the camera does not work this way. So he blew up the picture and was shocked at what he saw. The raw picture below, look close and see what you see. Note he was alone, there was no one at all in the area when picture was taken. You can see the blue green fog in distance, and up close what looks like a minister praying with the troops. The picture has been seen well over 1 million times, with some folks seeing one to as many as 12 images. Between the first and the third of July, 1863, more blood was shed in a formerly little-known Adams County farm community than at any battle in history. 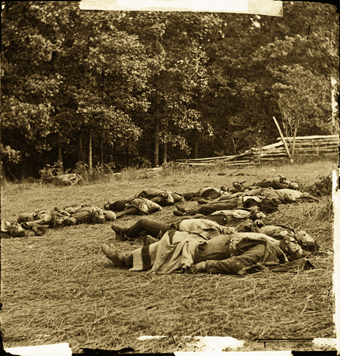 The deaths on the battlefield at Gettysburg numbered 7,500, and probably a tenth of the wounded died later. With around ten thousand men down in a few horrific days, it’s hardly surprising Gettysburg has its fair share of ghost stories. But oddly enough, one of the stories comes to us from the time of the battle itself. point that enabled them to rout a flank of Confederates and ultimately win the battle. The soldiers insisted that the glowing apparition they followed bore an uncanny resemblance to George Washington. There’s no denying this story reeks of propaganda—it’s only one step away from the old claim that “God is on our side”—but the story has had remarkably long life nevertheless. 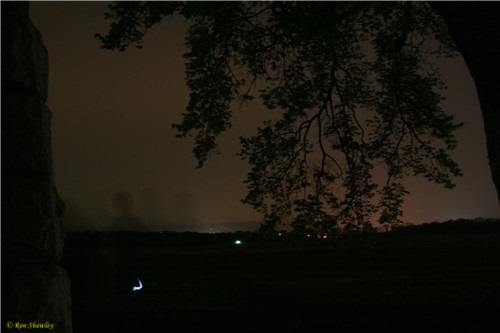 If you visit the National Military Park on a clear summer night, you will sometimes see fog creeping in and surrounding the field where so many people fell. Fog is always brings a creepy sensation with it, but such sudden ground mists are not exactly unusual weather for this kind of topology. But what’s inside the fog is a little more unusual. Lights flash on and off, appearing to advance along the same path that the Confederates took to Little Round Top. Sometimes, shadows or transparent apparitions appear on horseback. Although it’s hard to see anything in those conditions, these riders are often reported as being headless—though this may be due to an overactive imagination fired by too many readings of Sleepy Hollow. When you visit the huge boulders of the Devil’s Den, you may get helpful advice for framing the perfect photograph from a shabby looking youth sitting around in a big floppy hat. He’ll drawl from his perch that a certain pile of rocks would make a great photograph—but once you’ve snapped the scene, he’ll have disappeared. Folks call him the Helpful Hippy of the Devil’s Den. But far and away the most common ghostly phenomena at Gettysburg concern cameras. There were many photographs taken during the battle, but it seems nowadays that an unusual number of cameras malfunction on the field. Visitors often experience a chill when this happens—maybe because of the weather, maybe from a sudden supernatural fear, or perhaps from the presence of something not of this world. The Farnsworth House Inn on Baltimore St, Gettysburg, was 53 years old when it was riddled with bullets from the famous Civil War battle that takes its name from the town. It displays the hundred bullet holes from that battle proudly, and its staff is well versed in lore and legend of the era. The staff also has a spirited way of promoting the place as one of the top ten most haunted inns in America. Whether it’s the Mourning Theatre, the candlelit ghost tours, or the ghostly dinner theater presentation, the hostelry has a knack for turning occult happenings into palatable entertainment. House Inn. One of the rooms, the Garrett, is closed and padlocked because things used to get too hairy there. The lock on that door sometimes rattles of its own accord, and meanwhile, up in the garret’s ensuite bathroom, a bloody mess that’s almost impossible to clean sometimes appears. The room was apparently a post for three Confederate sharpshooters during the conflict, and presumably at least one of them was seriously injured or killed there. In another upstairs room, a bereaved man is heard sobbing inconsolably, and seen carrying a child wrapped in a quilt. The door to the cellar often opens to an apparition carrying a wounded comrade down to the catacombs, where a voice is heard singing quietly. And in true Sixth Sense mode, the temperature suddenly plummets inexplicably. Other rooms feature less frightening occurrences. The McFarland Room often contains strange sounds, including unusually heavy breathing (and close-up, not from neighboring rooms). The Schultz Room is supposedly often visited by a solicitous midwife who tucks you in, and a little boy. Both are considered very benign presences, but apparently one of them smokes cigars. The smell of particularly acrid cheroot often pervades the room in the wee hours of the night. With all the media attention paid to the Farnsworth House, it’s amazing they can fit any paying guests into the place. Carol Kirkpatrick the psychic, Ghost Hunters International, the Sci-Fi Channel, Unsolved Mysteries, and The History Channel have all visited and reported on the place. None of them reported getting tucked in for the night, but one can only assume that they just attracted a different ghost. The 72nd Pennsylvania Infantry Monument marks their “advance position”. This designation was invented by government historian John B. Bachelder after the war when the monuments of the Gettysburg Battlefield were being erected. Some historians have argued that the battle was the turning point of the war and that this was the place that represented the Confederacy’s last major offensive operation in the Eastern Theater. On the third day of the battle (July 3, 1863), Confederate General Robert E. Lee ordered an attack on the Union center, located on Cemetery Ridge. This offensive maneuver called for almost 12,500 men to march over 1,000 yards (900 m) of dangerously open terrain. Preceded by a massive but mostly ineffective Confederate artillery barrage, the march across open fields toward the Union lines became known as Pickett’s Charge; Maj. Gen. George E. Pickett was one of three division commanders under the command of Lt. Gen. James Longstreet, but his name has been popularly associated with the assault. Union guns and infantry on Cemetery Ridge opened fire on the advancing men, inflicting a 50% casualty rate on the Confederate ranks. One of Pickett’s brigade commanders was General Lewis Addison Armistead. His men were able to breach the Union lines in just one place, a bend in the wall that has become known as “the Angle.” This gap in the Union line was hastily closed with any Confederate soldiers who had breached it being quickly captured or killed, including Armistead. Lee’s Army of Northern Virginia retreated the next day, leaving Gettysburg for Virginia. Even though the war lasted almost another two years, Lee launched few offensive operations during that time, none of them near the scale of the Gettysburg Campaign. 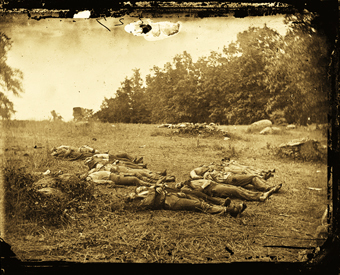 Panorama of the High-Water Mark from The Photographic History of the Civil War: In the center of the panorama rises Cemetery Ridge, where the defeated 1st and 11th Federal Corps slept on their arms on the night of July 1st, after having been driven back through the town by the superior forces of Hill and Ewell. The lower eminence to the right of it is Culp’s Hill. At the extreme right of the picture stands Round Top. This is one legend that turned out to be true. 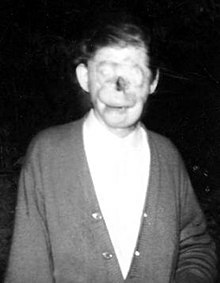 Residents of the South Park area near Pittsburgh during the 1950’s often spotted a strange figure walking along Route 351 at night. The figure was a man without a face who allegedly emitted a greenish glow– locals were frightened by his shocking appearance and his nocturnal habits. The man, Ray Robinson, had been severely electrocuted as a child and lost most of his facial features. He only came out at night due to his disfigurement, though in reality he did not emit a glow of any sort. He was actually a really nice guy who would chat with anyone who approached him, though this did not prevent some passers-by from treating him cruelly or the community from fostering ghost stories about his misfortune. Though Pennsylvania is land-locked, we do have access to Lake Erie, a member of the Great Lakes which are notorious for their violent, unpredictable storms. 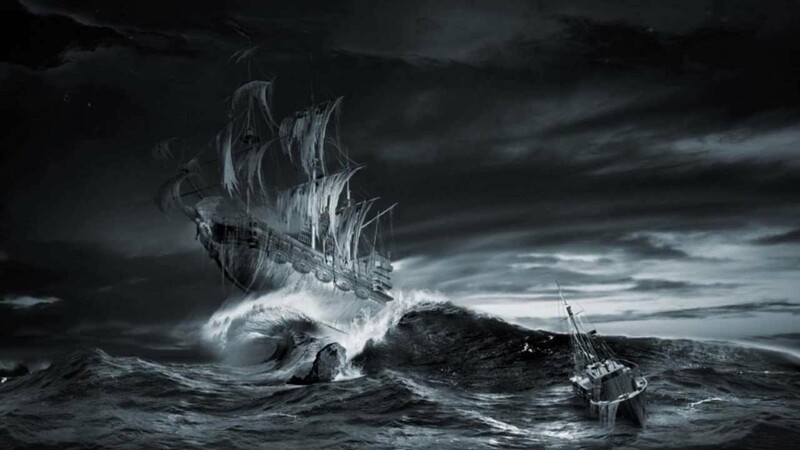 Presque Isle is an area of the lake notable for the large number of shipwrecks and disappearances that have occurred there– this is where the Storm Hag is said to live on the bottom of the lake, emerging only to feast upon unfortunate sailors. She has venemous nails, strong, wraith-like arms, green pointed teeth, slimy green skin, and cat-like eyes that are the last thing her victims ever see. Like a siren, she sings an enticing song immediately before attack. Susan and Ned were driving through a wooded empty section of highway. Lightning flashed, thunder roared, the sky went dark in the torrential downpour. “We’d better stop,” said Susan. Ned nodded his head in agreement. He stepped on the brake, and suddenly the car started to slide on the slick pavement. They plunged off the road and slid to a halt at the bottom of an incline. Pale and shaking, Ned quickly turned to check if Susan was all right. When she nodded, Ned relaxed and looked through the rain soaked windows. “I’m going to see how bad it is,” he told Susan, and when out into the storm. She saw his blurry figure in the headlight, walking around the front of the car. A moment later, he jumped in beside her, soaking wet. Susan swallowed nervously. There would be no quick rescue here. He told her to turn off the headlights and lock the doors until he returned. Axe Murder Hollow. Although Ned hadn’t said the name aloud, they both knew what he had been thinking when he told her to lock the car. This was the place where a man had once taken an axe and hacked his wife to death in a jealous rage over an alleged affair. Supposedly, the axe-wielding spirit of the husband continued to haunt this section of the road. Outside the car, Susan heard a shriek, a loud thump, and a strange gurgling noise. But she couldn’t see anything in the darkness. Frightened, she shrank down into her seat. She sat in silence for a while, and then she noticed another sound. Bump. Bump. Bump. It was a soft sound, like something being blown by the wind. Suddenly, the car was illuminated by a bright light. An official sounding voice told her to get out of the car. Ned must have found a police officer. Susan unlocked the door and stepped out of the car. As her eyes adjusted to the bright light, she saw it. Hanging by his feet from the tree next to the car was the dead body of Ned. His bloody throat had been cut so deeply that he was nearly decapitated. The wind swung his corpse back and forth so that it thumped against the tree. Bump. Bump. Bump. Susan screamed and ran toward the voice and the light. As she drew close, she realized the light was not coming from a flashlight. 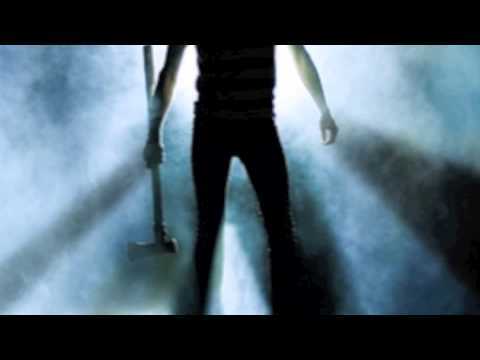 Standing there was the glowing figure of a man with a smile on his face and a large, solid, and definitely real axe in his hands. She backed away from the glowing figure until she bumped into the car. The last thing she saw was the glint of the axe blade in the eerie, incandescent light. Carnahan’s Blockhouse – An important fortress during the latter part of the American Revolution, this blockhouse was built much earlier by Adam Carnahan. Carnahan, who was the son of Irish immigrants had come to Westmoreland County prior to the Revolutionary War and built the Carnahan Blockhouse located about 11 miles northeast of Hannahstown, and about two miles from the Kiskiminetas River. Adam enlisted in Captain Jack’s Company Cumberland County, Pennsylvania Militia, and was called into service by order of the council on January 1st, 1778. He was transferred to Captain John Hodge Company on August 1, 1780 and served until the war ended in 1782. His blockhouse became a regular station during the war and a place of more importance after the garrison had been withdrawn from Fort Hand and placed along the line of the Allegheny River. Adam’s sons manned the blockhouse while their father was away. Adam’s son, John Carnahan, was killed by Indians just outside the blockhouse while trying to protect his family and others. Fort Allen (1774-1783?) – In 1774, about 800 pioneer settlers lived in Hempfield Township, in Westmoreland County, Pennsylvania. Fearful of Indian attacks, they petitioned the colonial government for aid and protection. In response, Fort Allen was built, believed to have been named for Andrew Allen of the state’s then governing body, the Supreme Executive Council. Commanded by Colonel Christopher Truby, the post was also known as Truby’s Blockhouse. The post protected the Harrold’s and Brush Creek settlements during Dunmore’s War in 1774 and the American Revolution; however, it was never involved in an emergency. There is nothing left of the fort today but a stone monument. It is located on the grounds of St. John’s Harrold United Church of Christ at the corner of St. John’s Church Road and Baltzer Meyer Pike, which is about 150 yards north of where the fort was located. Fort Augusta (1756-1794) – A stronghold in the upper Susquehanna Valley from the French and Indian War to the close of the American Revolution, Fort Augusta was built on the site of Shamokin, the largest Indian town and trading center in Pennsylvania. Built with upright logs facing the river, and lengthwise in the rear, and was about two hundred feet square. The main wall of the fort was faced about half its height by a dry ditch. A triangular bastion in each corner permitted a crossfire that covered the entire extent of the wall. The main structure of the fort enclosed officers’ and soldiers’ quarters, a magazine, and a well, the last two of which are still preserved. it is said to have had sixteen mounted cannons. On July 8, 1736 Shamokin was described as having eight huts beside the Susquehanna River with scattered settlements extending over seven to eight hundred acres between the river and the mountain. Terrified of vengeful white soldiers, the Indians burned their homes and abandoned the site in the days leading up to the French and Indian War. 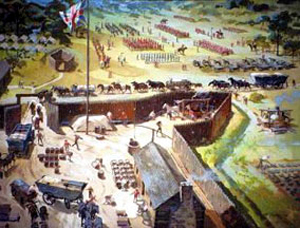 Within days, the British began construction of the fort in defense against the raids of the French and Indians from the upper Allegheny region. American Revolution, Fort Augusta was the military headquarters of the American forces in the upper Susquehanna Valley. The activities of the Northumberland County Militia, the sending of troops to serve in Washington’s army, and the support and protection of smaller posts throughout the valley were all directed from the fort, where Colonel Samuel Hunter, the last commandant, resided. During its use, Fort Augusta, with its strength and strategic location, was never forced to endure a siege. After the War, Colonel Hunter was allowed to retain the Commandant’s Quarters as his property. Over the years, it gradually deteriorated, but his descendants continued to live there until 1848, when the log house burned. Four years later, Hunter’s grandson, Captain Samuel Hunter, built another home. Both men are buried in the Hunter-Grant Cemetery across the street. In 1930, the Commonwealth of Pennsylvania purchased the land on which the well and magazine are located, and, in 1931, acquired the larger tract, which included The Hunter House. The Fort Augusta property is now the headquarters of the Northumberland County Historical Society in Sunbury, Pennsylvania. Fort Bedford, PennsylvaniaFort Bedford (1758-1770) – A French and Indian Warr-era British military fortification, this post was located in what was first called Raystown, Pennsylvania which was first settled in 1751. See full article HERE. Fort Boone (1777-1779) – Located near Milton, Pennsylvania, this fortress was situated about one mile north of Milton near the mouth of the Muddy Run River. A gristmill, it was operated by Captain Hawkins Boone, who was not known to have been related to the more famous Daniel Boone. During the American Revolution, three locals, including Captain Hawkins Boone, Captain John Brady, and Captain Samuel Daugherty were mustered out of the 12th regiment and sent, at the request of the people of the West Branch of the Susquehanna River Valley, to lead their defense. Captain Boone stockaded his mill, assisted by the two other captains and his neighbors and troops who were defending it. A large, hardy, brave, generous man, he appears to have been highly respected by those knowing him. When the three captains at Fort Boone heard about a large attack on nearby Fort Freeland, they and their troops rushed to provide aid and all three were killed. This area was extremely volatile during the Revolutionary War because it was at the farthest edge of the frontier, where there were frequent attacks on the colonists by the British army, American loyalists and Native American tribes aligned with the British. Beyond this point, there was no colonial government and no protection. However, there were several other small forts in this area, most notably, Fort Freeland. In late June, 1779 after repeated attacks by the British, a number of colonial families moved from their homes to live behind the walls of Fort Freeland. Although there were rumblings of a pending attack, the colonists were completely unprepared when more than 300 British soldiers and supporters stormed the Fort Freeland early on the morning of July 28, 1779. With all the able-bodied men already off to war, there were only 21 boys and old men to defend the fort. Seeing the hopelessness of their situation, the colonists soon negotiated a surrender. News of the attack reached Captains Hawkins Boone, John Brady, and Samuel Daughterty who were leading the defense at nearby Fort Boone. A relief party rushed into defend the Fort Freeland, not knowing that it had already surrendered. The battle that followed was one of the bloodiest of the American Revolution and pivotal because the fall of Fort Freeland left the colonial American frontier defenseless. All three captains were killed. Later, another mill called the Kemmerer Mill was built at the same site as Boone’s Mill. It was located about about midway between Milton and Watsontown. Fort Bosley (1777-1883?) – Located in the forks of the Chillisquaqua River at Washingtonville, Pennsylvania, a gristmill was built in in about 1773 by a Mr. Bosley, who moved here from Maryland a few years before the American Revolution. The Chillisquaque Valley and its surroundings are among the most beautiful in Pennsylvania. This great scope of fine arable lands attracted settlers early and Bosley’s Mills became a necessity. It soon became widely known; roads and paths led to it as a central point, and on the Indians becoming troublesome and the mill stockaded in about 1777. It became a haven of refuge at which the wives and families could be placed in safety at alarms, while the husbands and fathers scouted for intelligence of the enemy or defended the fort. It was soon recognized by the military authorities as post of importance and was garrisoned by troops. After the fall of Fort Freeland in July, 1779, the fort became even more important, holding the forks of the Chillisquaqua River and defending the stream below it. Though the fort was never heavily garrisoned, estimated to have had only 20 men at most, it was strong, and there are no records of any attacks. Somewhere, along the line Bosley’s Mill was replaced by a more modern mill. It was located just outside of the town of Washingtonville, somewhere near Muddy Run and the Chillisquaque Creek meet. Fort Brady (1777-1779) – The dwelling house of Captain John Brady, this “fort” was located at Muncy, in Lycoming County, Pennsylvania. Captain John Brady had been a captain in the Scotch-Irish and German forces west of the Alleghenies under Colonel Henry Bouquet in his expeditions during the French and Indian War and had received a grant of land with the other officers in payment for his services. In the American Revolution, he was a captain in the 12th Pennsylvania Regiment and was wounded at the battle of the Brandywine. His son, John, a lad of 15 years, stood in the ranks with a rifle and was also wounded. Sam, his eldest son, was in another division and assisted to make the record of Parr’s and Morgan’s riflemen world famous. The area of the West Branch of the Susquehanna River, in its great zeal for the cause of the colonist, had almost denuded itself of fighting men for the Continental Army. Consequently, on the breaking out of Indian hostilities a cry for help went up from these sparsely settled frontiers. General George Washington recognized the necessity, but was unable to relieve them. He did, however, muster out several officers to organize a defense of the area. Captain John Brady was one of the officers mustered out and soon after the Battle of Brandywine, he came home and in the fall of 1777, stockaded Fort Brady. He did this by by digging a trench about four feet deep and setting logs side by side, filling in with earth and ramming the logs down solid to hold the palisade in place. They were about twelve 12 feet high from the ground, with smaller timbers running transversely at the top, to which they were pinned, making a solid wall. Captain Brady’s house was a large one for the time. Fort Brady quickly became a place of refuge to the families within reach in times of peril and continued so until after the death of the valiant captain and the driving off of the inhabitants. On April 11, 1779, taking a wagon and a guard, he made a trip up the river to Wallis to procure supplies. Brady was riding a fine mare some distance behind the wagon. A young local man by the name of Peter Smith, was walking along with him. After securing a quantity of provisions, the two started their return in the afternoon. When within a short distance of his home, Brady suggested to Smith the propriety of his taking a different route from the one the wagon had gone, as it was shorter. They traveled together until they came to a small stream of water called Wolf Run, where the other road came in. Brady observed: This would be a good place for Indians to hide; Smith replied in the affirmative, when three rifles cracked and Brady fell from his horse dead. As his frightened mare was about to run past Smith, he caught her by the bridle and, springing on her back, was carried to Brady’s Fort in a few minutes. The report of the rifles was plainly heard at the fort and caused great alarm. Several persons rushed out, Mrs. Brady among them, and, seeing Smith coming at full speed, anxiously inquired where Captain Brady was. It is related that Smith, in a high state of excitement, replied: “In Heaven or hell, or on his way to Tioga,” meaning he was either killed or a prisoner by the Indians. The Indians, in their haste did not scalp him, nor plunder him of his gold watch, some money and his commission, which he carried in a green bag suspended from his neck. His body was brought to the fort and soon after interred in the Muncy burying ground, some four miles from his home. In May, Buffalo Valley was overrun by the enemy and most of the people left. On July 8, 1779, Smith’s Mill, at the mouth of the White Deer Creek was burned, and on the 17th, Muncy Valley was destroyed. Starrett’s Mills and all the principal houses in Muncy Township were also burned, along with Forts Muncy, Brady and Freeland, and Sunbury. The site of Fort Brady is within the town of Muncy today. Fort Deshler, PennsylvaniaFort Deshler (1760-1763) – This French and Indian War era frontier fort was built by Adam Deshler, who was employed to furnish provisions for provincial forces. The fortified stone blockhouse, was about 40 feet long and 30 feet wide, with walls that were 2 1/2 thick. It also served as Deshler’s home. Adjoining the building was a large wooden building, suitable as barracks for twenty soldiers and for storing military supplies. However, there is o evidence that the fort was ever garrisoned, serving instead refuge and rendezvous for settlers of the region. Located near the present-day intersection of Pennsylvania Route 145 and Chestnut Street, between Egypt and Coplay, it remained in the Deshler family until 1899, at which time the building and its remaining 151 acres, were sold to the Coplay Cement Company. Never preserved, it deteriorated until it finally collapsed in about 1940. Today, all that is left is a historic marker. Fort Dickinson/Durkee (1769-1784) – In 1769, Major John Durkee and his men erected Fort Durkee on the eastern bank of the Susquehanna River at what is present-day Wilkes-Barre, Pennsylvania. The fort included four small blockhouses and was armed with four guns. In the beginning, it was manned by about 100 men. The fort changed hands several times during what was known as the Yankee-Pennamite War, a conflict between Pennsylvania and Connecticut over the ownership of the Wyoming Valley. At the conclusion of the American Revolution, Congress was asked to decide on the legal owner and on December 30, 1782 adopted the Decree of Trenton, which granted the land to Pennsylvania. The Commonwealth of Pennsylvania then ruled that the Connecticut Yankees were not citizens of the Commonwealth, could not vote, and were to give up their property claims. Fort Durkee was renamed Fort Dickinson in 1783. It was destroyed by Connecticut Yankees in November, 1784 during the Second Yankee-Pennamite War. Fort Duquesne – Established by the French in 1754, this post was situated at the junction where the Allegheny and Monongahela Rivers come together to form the Ohio River, in what is now downtown Pittsburgh, Pennsylvania. See full article HERE. Fort Freeland, PennsylvaniaFort Freeland (1778-1779) – Situated on Warrior Run Creek, about four miles east of Watsontown, Pennsylvania, the site first held a mill built by Jacob Freeland in about 1774. In 1772, Jacob Freeland and several other men from Essex County, New Jersey, cut their way through the dense woods and settled with their families in in the area. More families soon followed and they lived on friendly terms with the Indians until 1777, when tribes began to rebel. At this time, many of the settlers removed their families; but, in the fall of 1778, the men returned and stockaded the home of Jacob Freeland. The pickets enclosed Freeland’s large two-story log house and enclosed a half acre of ground. That winter, several families moved into the fort. In the spring of 1779, the men planted corn and were occasionally surprised with the Indians, but, nothing serious occurred until the July 21, 1779 when some of the men working in the field were attacked by a party of Indians in the morning. Isaac Vincent, Elias Freeland and Jacob Freeland, Jr., were killed and Benjamin Vincent and Michael Freeland were taken prisoners. Ten year-old Benjamin Vincent hid in a furrow, but, he was also captured. on fire and burned down. The effect of the fall of Fort Freeland and the desertion of Fort Boone was disastrous to the region left Fort Augusta uncovered to the inroads of the enemy. In the meantime, Colonel Samuel Hunter, commanding Fort Augusta, had few men and finally in November, a German Battalion of about 120 men was sent to him. After securing Fort Augusta, he ordered his men to build Fort Rice and Fort Swartz and garrisoned both. Years later, the Hower-Slote House was built on the site of Fort Freeland in 1829 by James Slote. Built in the Federal style, it was the center of a working farm for more than 125 years. It still stands today. Fort Gaddis (1764?-1783?) – This fort was built by Thomas Gaddis, who was in charge of the defense of the region, in about 1764, on the Catawba Trail, an important north-south route that extended from New York to Tennessee and passed through Uniontown, Pennsylvania and Morgantown, West Virginia. It was utilized as a place of refuge from the hostile Indians, as well as a site for community meetings. Gaddis was later a colonel in the Pennsylvania Continental Line during the American Revolution. The 1-1/2-story, 1-room log structure measures 26 feet long and 20 feet wide. During the Whiskey Rebellion a Liberty Pole was erected at the house during a rally in support of the rebel cause. The choice of this site for a political demonstration indicates its importance as a focal point for community expression. In the 19th century the Catawba Trail became locally known as the Morgantown Road. It is now Old U.S. Route 119. The building was added to the National Register of Historic Places in 1974 as the “Thomas Gaddis Homestead”. 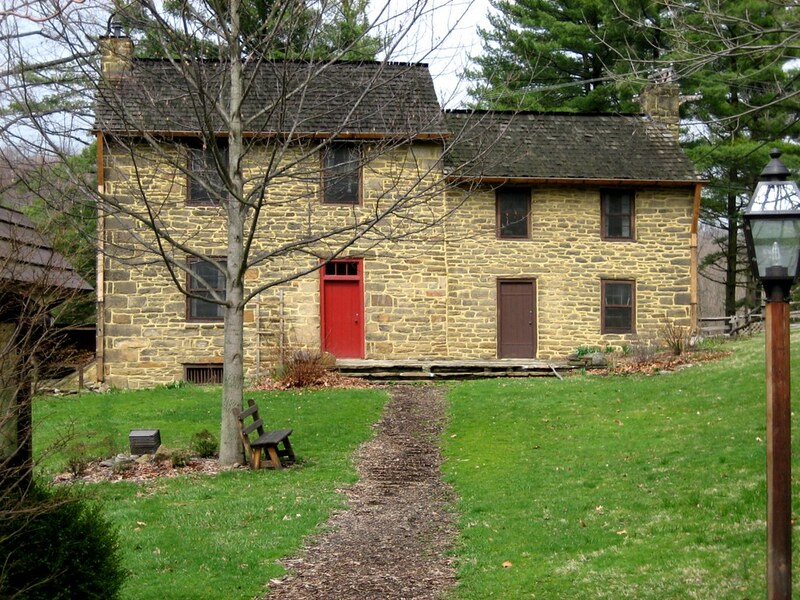 Today, Fort Gaddis is the oldest known building in Fayette County, Pennsylvania and the second oldest log cabin in Western Pennsylvania. It is located about 300 yards east of old U.S. Route 119, near the Route 857 intersection in South Union Township, Fayette County, Pennsylvania. Fort Granville (1755-1756) – Situated on the west bank of the Juniata River near present-day Lewistown, Pennsylvania, this fort, with blockhouses at each corner, was built in the winter of 1755-56 under the supervision of George Croghan. It was named after John Carteret, the Earl of Granville. Each side was about 100 feet long. The French and Indians challenged the fort on July 22, 1756 and when Captain Edward Ward refused their surrender demands, the French and Indians split-up and plundered the farms of a Mr. Baskin and then Hugh Carroll — making them prisoners. On July 30, 1756 Captain Ward went with a majority of his men to help protect harvesters in Shearman’s Valley. Observing his departure, about 100 French and Indians took advantage of the depleted defense and overran the fort — burning it to the ground. They were led by Louis Coulon de Villiers and Captain Jacobs (Tewea, a Delaware war chief. Lieutenant Edward Armstrong, who had been left in charge during Captain Ward’s absence, was killed during the defense of the fort. When the fort fell, a man named Turner accepted the surrender demand offering passage for the survivors. After the capitulation, the 22 soldiers, three women and seven children were loaded-up and taken to Kittanning. Turner was scalped alive and burned at the stake at Kittanning. The fall of Fort Granville confirmed the vulnerability of the string of forts on the western frontier of Pennsylvania. Fort Halifax (1756-1757) – Located along the Susquehanna River near the present-day city of Halifax, this was temporary stronghold in the French and Indian War. A subpost of Fort Augusta, the fort was erected by Colonel William Clapham, under orders from Gouverneur Morris. The 160 feet square log stockade with four bastions was guarded by a garrison of the Pennsylvania Colonial Militia. It was dismantled in 1757 and its garrison was moved to Fort Hunter. In 1926 a stone monument was erected to designate the site of the fort. It is located along PA Route 147 north of Halifax along Armstrong Creek. The area of the former fort is now part of the Halifax Township Park and Conservation Area. What started as a tax in 1791 led to the Western Insurrection, or better known as the Whiskey Rebellion of 1794, when protestors used violence and intimidation to prevent federal officials from collecting. On March 3, 1791, Congress instituted a tax on distilled liquors to help pay off the debt from the American Revolution. Treasury secretary Alexander Hamilton had initiated a program to increase central government power, and the tax was to fund his policy of assuming war debt of those states who failed to pay. During this time the western part of Pennsylvania was separated from the east by the Allegheny Mountains. Farmers, the majority of the population, found there was a limited market for their grain locally, and it was difficult to transport the grain to the east for sale. So instead, farmers converted their grain to whiskey, which made it easier to transport and more marketable. The excise tax, passed in 1791 on all distilled spirits, was based on the capacity of the still rather than the quantity of production. In addition it was required to be paid in cash, which at the time was unusual since whiskey was often used by those in western Pennsylvania to pay for goods and services. The tax was also uneven in the way it was collected between small and large producers. Smaller still operations were required to pay the tax throughout the year at about nine cents per gallon. Larger producers in the east, who benefited from cheaper transportation costs, could decrease their tax by increasing their volume, and were allowed to make annual payments that amounted to six cents per gallon. The farmers of western Pennsylvania were already upset with the government over a lack of protection against Indian attacks. The tax just added to their frustration and they felt that this direct interference by the government into their business, was unjust, and a violation of their rights. Many of them war veterans, they argued they were fighting for the principals of the American Revolution and taxation without local representation. This immediately led to an organized resistance to the tax in the summer of 1791, with many farmers refusing to pay. Collectors were ambushed, humiliated and some even tarred and feathered. The violence continued to escalate over the next several years and spread to other counties until it came to a head in the summer of 1794. That May, subpoenas were issued for over 60 distillers who had not paid the tax. Those served with the subpoenas were, under law, obligated to travel to Philadelphia to appear in federal court, which was a burden to those on the western frontier and beyond many of their means. So in June Congress modified the law so that they could appear in local state courts, but by that time U.S. Marshall David Lenox, under Alexander Hamilton’s direction, was already serving writs saying they had to come to Philadelphia. Over the years, historians have argued that Hamilton intentionally did not wait for the change in the law to serve the writs in order to provoke violence that would justify federal military intervention. Others have called it a string of ironic coincidences. Regardless, by mid July Federal Marshal Lenox had served most of the writs without incident. However on July 15, Lenox and Federal Tax inspector General John Neville were fired upon at the farm of Oliver Miller, about 10 miles south of Pittsburg. The men split up with Lenox retreating to Pittsburgh and Neville returning home to Bower Hill. That next day around 30 Mingo creek militiamen showed up at Bower Hill demanding the surrender of Lenox, who wasn’t there. Neville responded by firing a shot from his fortified home, mortally wounding Oliver Miller. The rebels then retreated to Couch’s Fort for reinforcements. By the time they returned the next day they had 600 men, and were now commanded by Major James McFarlane, a revolutionary war veteran. Portrait of Alexander Hamilton by John Trumbull, 1792. Neville also had some reinforcements with 10 U.S. soldiers from Pittsburgh under the command of Major Abraham Kirkpatrick, whom before the rebels arrived had Neville leave the house to a nearby ravine. In the meantime, Lenox and Neville’s son returned the the area but were captured by rebels. Historians say it is unclear how many casualties resulted, but after failed negotiations between the rebels and Kirkpatrick shots were fired, and after an hour rebel leader McFarlane called for a cease fire. As he stepped into the open a shot from the house killed him, which enraged the rebels who then set fire to the house, forcing Kirkpatrick to surrender. Kirkpatrick, along with Lenox and Neville’s son Presley, were kept as prisoners but later escaped. McFarlane’s death fueled rage among the rebels, whose leaders started urging more violent resistance. In late July, a group led by David Bradford robbed the U.S. mail as it left Pittsburgh so they could go through the letters and see who opposed them. Finding several, Bradford called for men to meet at Braddock’s field on August 1. Some 7,000 showed up, many of them not even land owners, nor distillers, but upset over the tax and other economic issues. Much of the anger was directed at wealthy families who had no connection with the tax. There was even talk of declaring independence from the United States. Some plans included marching through Pittsburgh and loot and burn homes of the wealthy. Luckily this was defused by Pittsburgh citizens who banished several men who opposed the rebels and expressed support for the rebellion. In the meantime, President George Washington was doing his best to confront the armed insurrection, while at the same time maintaining positive public opinion. He decided to send a peace commission to meet the rebel committee, but at the same time try to raise a militia through the states. Hamilton, writing under the name of “Tully” in Philadelphia newspapers, denounced the mob violence in western Pennsylvania and advocated military action. On August 7, 1794, Washington issued a proclamation stating that with deepest regret the militia would be called to suppress the rebellion. He called for the rebels to disperse by September 1. Enacting the Militia Act of 1792, which allowed the President, with Federal court approval, to use State militiamen for instances like this, letters were sent to governors of Maryland, New Jersey, Pennsylvania and Virginia requesting almost 13,000 men. This also caused problems as few men volunteered and a draft was used to fill the ranks. Protests and riots, along with draft evasion were wide spread. During this time, Washington’s militia of 13,000 were gathered at Carlisle Pennsylvania, and on September 19, President Washington himself began leading the troops on a nearly month long march west over the Allegheny Mountains to the town of Bedford. On September 25, after getting the report from the peace commission, Washington issued a proclamation that he would not allow “a small portion of the United States dictate to the whole union.” He called on all citizens not to aide the rebels. Washington remains the only sitting President to personally lead troops in the field. After getting them to Bedford, Washington returned to Philadelphia, placing General Henry Lee in command. Alexander Hamilton also remained with the troops. In late October the Federalized militia began entering the western counties of Pennsylvania, and the rebel organization began falling apart. By mid November 150 rebels, including 20 of its leaders, had been arrested. On November 29th, under the direction of President Washington, General Lee issued a general pardon for all but 33. Of those only a few were tried and two convicted, who were also later pardoned. President John Adams would later pardon David Bradford in 1799. Bradford had escaped to then Spanish controlled New Orleans. Washington leads troops during the Whiskey Rebellion. Frederick Kemmelmeyer 1795. Portrait of General Henry Lee, former Governor of Viriginia, William E. West, 1838. While the physical and violent opposition to the tax was over, the political opposition continued. That opposition would help Thomas Jefferson defeat President Adams in the 1800 election. In 1802, Congress repealed the distilled spirits excise tax and all other internal Federal taxes, relying solely on import tariffs for revenue, which were growing along with the Nations foreign trade. Michael Strank (November 10, 1919 – March 1, 1945) was a United States Marine Corps sergeant of Ukrainian-Lemko origin who was killed in action during the Battle of Iwo Jima in World War II. He is best known for being one of the six flag-raisers who helped raise the second U.S. flag atop Mount Suribachi on February 23, 1945 as shown in the iconic photograph Raising the Flag on Iwo Jima.The Marine Corps War Memorial located in Arlington, Virginia, which was modeled after the flag-raising photograph, depicts bronze statues of each of the six Marine flag-raisers.